HostedGraphite is a great service for graphing and visualizing all sort of data. Here's how you can use it with Screenly. HostedGraphite is an excellent service for graphing and visualizing all sorts of data. As the name implies, HostedGraphite offers a hosted Graphite solution. HostedGraphite collects data in your preferred programming language, and the HostedGraphite team built the software with the goal of allowing users to automate their data collection entirely via API. Once you have HostedGraphite collecting your data, you can set alerts for unexpected data trends and drops in data collection. You can receive these alerts on popular communication tools including PageDuty, HipChat, Slack, and email. HostedGraphite also makes it easy to share data with your team and partners, with team management features as well as support for Single Sign On (SSO) functionality with SAML. As a customer, you also get access to Grafana, Statsd, Tasseo and other powerful tools. Regardless of if you’re trying to plot business metrics, performance metrics, or system stats, HostedGraphite is a great tool to have in your toolkit. As with all data dashboards, a dashboard can only benefit a team if team members regularly view and discuss the dashboard data. Data dashboards and digital displays are a natural pair, as a digital display allows team members to view company data easily throughout the day. Once you start pushing data to HostedGraphite, you need to create a dashboard to view and make sense of this data. Our preferred dashboard tool when working with HostedGraphite is Grafana, as Grafana looks a lot better than Graphite. Simply follow the Grafana dashboard guide to create a dashboard from your HostedGraphite collected data. 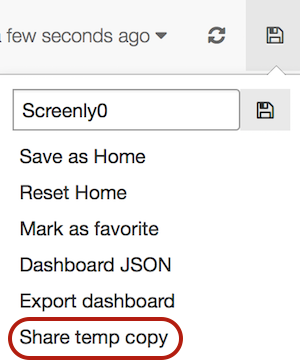 With your dashboard(s) created, you need to add them to Screenly. To do this, you need to use the ‘Share temp copy’ feature in the user interface. This page will generate a secret URL (much like we did in our Nagios guide). Once you have your secret URL, add it as a URL asset in Screenly. You can then assign this asset to desired playlists and schedule your content to play on your screens. Use dedicated dashboards for Screenly. Since Screenly uses a resolution of 1920x1080px, you should optimize your dashboards for this resolution. A good rule of thumb for your dashboard size is three rows that are each 300px tall. Dashboards of this size will typically fit well on Screenly-powered digital displays. You can create multiple dashboards, such as one for marketing and one for sales performance. You do not need to have every metric for your company compacted into one screen. Are you ready to give Screenly a go? Sign up for Screenly Pro.